I love making homemade toys for my kids and I have been so inspired by the plethora of homemade peg dolls that I have found via Pinterest. 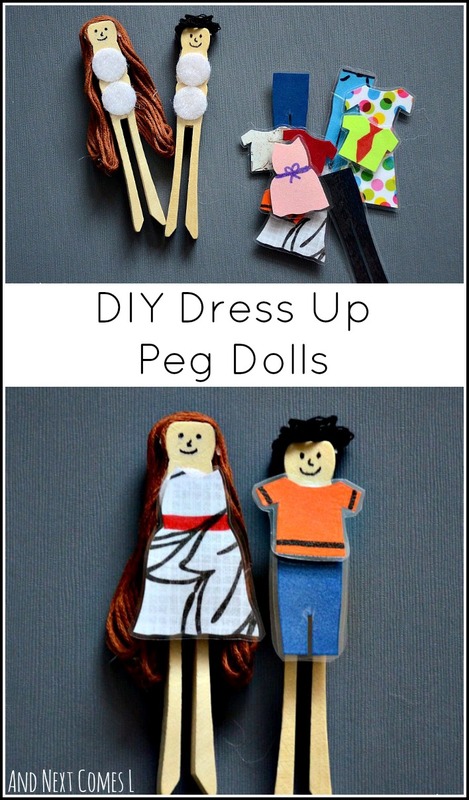 So here is my modern day, fine motor twist to peg dolls: DIY dress up peg dolls! Naturally, I think my ideas are awesome. Okay, maybe like 99% of the time I think they are awesome. Then there are times were I completely outdo myself and make something so stinking cute that I often wonder where my creativity comes from. I do like to attribute my creativity to good inherited genes from my mom and dad and I'm sure they would be more than pleased to take credit! 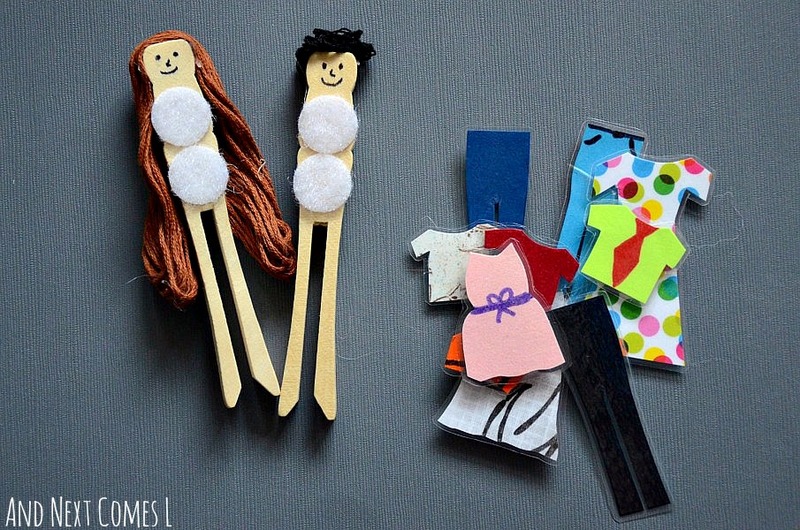 Well, anyway, these DIY dress up peg dolls are just one of those awesome ideas. Plus, these itty bitty dress up peg dolls are so easy to make and they're ridiculously cute! I have made a handful of peg dolls before like the Canadian peg dolls and Super Why peg dolls, but these are the first to come with a complete interchangeable wardrobe of their own. It's like those paper dolls from when I was a kid. Remember those? I made one boy and one girl peg doll. No, they are not anatomically correct (that is directed at my husband and one of my blog buddies who both asked if they were), but they do have stereotypical boy and girl hairdos. They're cute, aren't they? Well, they are pretty simple to make too! First, I drew facial features on two wooden peg dolls using an ultra fine point permanent marker. I then attached two sticky back velcro dots from the dollar store onto their little bodies (one for the upper body and one for the lower body). I was originally going to leave the peg dolls bald, but after my four year old requested that they have “mommy and daddy hair,” I gave them some lovely locks. Although daddy does not have wild longish black hair. I may have also exaggerated the lusciousness of my hair. Oh, and the length. Regardless, the peg dolls ended up with some beautiful hair, leaving us with one clearly defined boy doll and one clearly defined girl doll. I made one of each gender with the intention of practicing speech concepts with my son. Specifically, we use these dress up peg dolls to practice pronouns (e.g., "He is wearing an orange shirt." and "She is wearing a dress."). To make the hair, I just folded up some embroidery floss and carefully adhered it using a hot glue gun. No fingers were burned during the process, thankfully, but do be careful on this step. As for the clothes, I used scrap pieces of scrapbook paper and cardstock. I cut out dresses, pants, skirts, shirts, and shorts. I then decorated a few articles of clothing with some permanent markers as an added touch. I then ran all of the clothing through my laminator and attached the opposite type of sticky back velcro dots on the back. Alternatively, you could make felt clothes instead of laminating paper clothes. Then these DIY toys are all ready for some dress up fun! This post originally appeared on B. Inspired Mama. You can read the original post here. So wonderful! pinning and scheduled to share next week. Love it! I think your ideas are awesome too! And these are really cool!